On Tuesday, United States Citizenship and Immigration Services (USCIS) officials revealed that the agency processed nearly seven million immigration-related applications in just one year alone (fiscal year 2014). Because the agency does not have the resources to conduct in-person interviews with every applicant, officials noted that applicants for President Barack Obama’s Deferred Action for Childhood (DACA) program did not have to go though face-to-face interviews before being granted temporary amnesty. 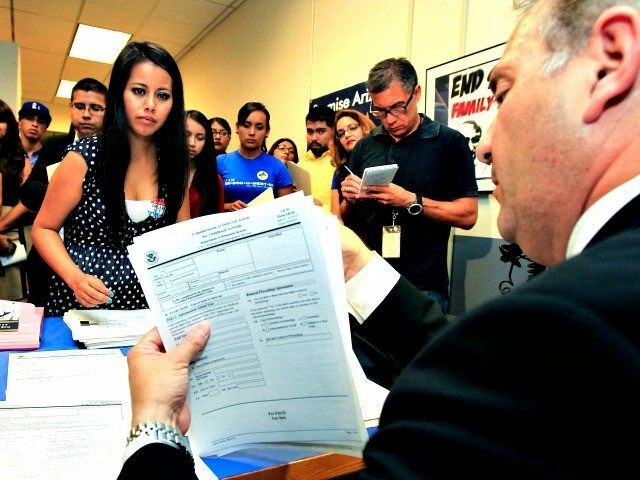 Potential applicants for President Barack Obama’s executive amnesty program for the illegal immigrant parents of U.S. citizens will also not be given in-person interviews if the federal government is allowed to proceed with its implementation after the court case against it is resolved. He said that in fiscal year 2014 alone,”USCIS adjudicated nearly 7 million petitions and requests,” including applications for President Barack Obama’s 2012 Deferred Action for Childhood Arrivals (DACA) program, naturalization and adjustment of status, visas, asylum and refugee requests, and humanitarian protections. Neufeld also said that USCIS has four service centers throughout the country (Dallas, Texas; Laguna Niguel, California; Lincoln, Nebraska; and St. Albans, Vermont) in addition to its headquarters in Washington, D.C. to “adjudicate applications, petitions and requests that do not require face to face interactions with the public”–such as Obama’s executive amnesty program. Sen. Jeff Sessions (R-AL), who chairs the subcommittee, pointed out that lawful immigrants who apply for visas in various countries around the world have to be personally interviewed, and that illegal immigrants who are seeking temporary amnesty are processed with “less standards” and less scrutiny than those trying to come to the United States legally. Sessions noted that Palinkas has also criticized the agency’s assembly-line adjudication process that often rubber-stamps applications. When Renaud said that there is a “layered” process to reading and processing applications in which different officials look at different parts of the application, Sessions said that is a “dangerous” system. He said that because one official does not read the whole file, it removes the responsibility on the certifying officer because he can claim that another official “did not pick up something” in the application. Sessions told the officials that they have been “asked to do more than is physically possible” in trying to vet all of the executive amnesty applicants for ties to gangs or other past criminal activity. “You just don’t have the ability to do this,” Sessions said, emphasizing that Obama should never have demanded amnesty for millions of illegal immigrants when there is not even enough staff and resources to process legal immigrants. Renaud said officials must “use their judgment” to determine if the evidence meets the very low “preponderance of evidence” standard before admitting that the agency did not even have standard operating procedures in place for cases in which an applicant without a middle initial on the application submits suspicious documents with a middle initial. Citing the recent case of an illegal immigrant who may have murdered a former “America’s Top Model” contestant after being granted executive amnesty, Sessions pointed out that USCIS lacks the resources to interview executive amnesty applicants on the ground if there is evidence that an applicant is a gang member.